In the nearly 40 years of living in Israel, I have watched Israel go from the heights of euphoria, immediately after the Six Day War in 1967 (actually believing that there would be no more wars), to reeling from the rocket blitz of 4,000 rockets on Galilee by Hizbollah terrorists last summer, encouraged and abetted by the United Nations, which in turn is controlled by the Islamic block and its sympathizers. I have witnessed the many years of Israel’s up-and-down struggles to ward off incessant terrorist onslaughts, of going to war in Lebanon (now twice), never being allowed to win by the world powers, experiencing unending war along one border and then another. I watched while Israelis held their breath, hoping against hope that the Oslo Accords and the Rabin-Clinton-Arafat handshake in 1993 would finally bring real peace. Ari, myself, and our two children, were all here during the missile attacks on our city by Saddam Hussein, the Intifada I and then Intifada II, when suicide bombers appeared everywhere. This month marks the 40th year since Jerusalem was miraculously returned to the hands of the Jewish nation. What have we now? Despair. Total despair! When Israel’s politicians and military authorities see the Hamas terrorists in Gaza, the Hizbullah terrorists in Lebanon, Syria threatening war and Iran promising to nuke Israel out of existence, they are simply without solutions. Israel’s correspondents, intellectuals, pundits, columnists, newscasters and opinion makers as well as the man on the street have finally come to the conclusion that there is no solution for Israel to find peace with her neighbors. Israel has finally run out of ideas. Israel, who would give half her kingdom for peace, has found that there is no peace, near or far away. In all the past years that have brought war and terror, never has there been such hopelessness. From every perspective, says Derfner, Israel sees no light. Ehud Olmert’s government is treading water, going nowhere and is interested only in its own political survival. Neither the Left nor the Right has any idea how to gain security. In southern Lebanon, Hizbullah is quickly rebuilding its military wing under the nose of the UN soldiers and has begun receiving shipments of long-range, Iranian-made missiles smuggled into Lebanon by Syria in the dead of night. These missiles will not only reach Haifa this time, but Jerusalem and Tel Aviv. Hizbullah’s vast underground systems of tunnels and bunkers are still operating in southern Lebanon. They simply designate those areas as “closed military zones” and forbid the UN troops to enter. 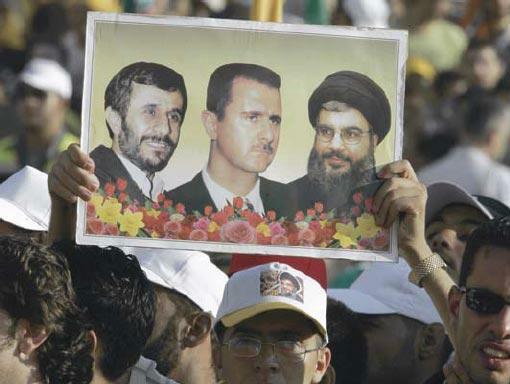 Meanwhile, through mass demonstrations, Hizbullah is attempting to forcibly unseat Prime Minister Fouad Siniora, which would be a fatal blow against the nascent attempt at democratic elections, and would mean a Hizbullah takeover of the nation which borders northern Israel. In my opinion, President George Bush’s great strategic miscalculations in his war against a cruel dictatorship stemmed from the fact that he understood nothing about the nature, the theology and the goals of fundamental Islam. He thought his armies would be fighting (1) to break the yoke of a terrible, cruel despot and (2) to give the gift of freedom to a grateful Muslim nation, horribly victimized, so that it could rule itself. He knew nothing about Islam, whose mission is to conquer the world. His advisors did not tell him that true Muslim believers cannot theologically tolerate non-Muslim nations or cultures that might appear superior in moral and human values or physical might. Since the greatest glory of the Islamic world is to die a martyr, it has no psychological restraints in killing or being killed as long as it moves toward its goal of bringing the world’s population under Sharia law - at any cost. A Syrian-born psychiatrist and pundit Wafa Sultan told Ruthie Blum, the Jerusalem Post’s feature editor, that there is no truth to the idea that Islam was hijacked by extremists. The more she studied her faith, the more she realized that it is inherently violent, and that the Koran teaches the goals of jihad to be incumbent on every true believer. Sultan’s serious research into the holy texts led to her own personal rejection of the religion. The faith, she says, cannot be reformed…It is important to realize the cruelty of an ideology that can harden the heart of a mother, or can consider young lives as expendable. Not long ago, I saw a special on the BBC that said there are 30,000 midrassahs (Islamic religious schools) in Pakistan alone. It explained that the children, starting at five years of age, study from 6:00 a.m. to 12:00 p.m. with a couple of breaks to eat! And they learn, verse by verse, to quote the Koran by heart from beginning to end. That is the entirety of their education! What will they ever do to make a living except to be a jihadist? So Israelis understand the root cause of the Middle East turmoil; it is the Islamic mission given to Muslims by Allah, to kill the Jews and make the world Muslim. The root ideology sends up shoots that come out here and there. 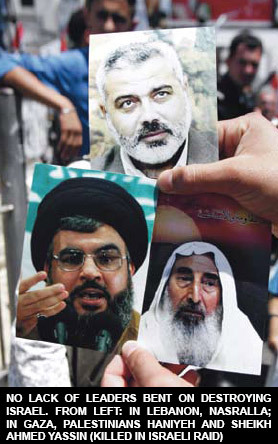 To Israel’s north is Allah’s warriors in the form of Hizbullah. In the south, they are called Hamas. He continues, “A key aspect of Hamas strategy is ensuring that the educational system raises a generation that will reject any peace or compromise with Israel, extol terrorism and vote Hamas.” That, of course, comes through religious Islamic schools. WHO HAS AN ANSWER FOR IRAN? Israeli holocaust survivors who are still alive say Mahmoud Ahmadinejad sounds eerily like Adolf Hitler in the late 30’s and 40’s. Wiping Israel off the map is a reoccurring, dominant theme of Ahmadinejad’s mission in life. Likud Knesset Member Yuval Steinitz who chaired the Foreign Affairs and Defense Committee in the last Knesset and who was privy to Israel’s intelligence community, states that besides Iran being an existential risk to Israel, there is also Egypt. Egypt? Steinitz sees an existential threat through an Egyptian-Saudi axis in the south and a Syrian-Iranian axis in the north. Concerning Egypt, he states that “the facts show that a vast army is being built in Egypt. Egypt faces no threats and has no active border disputes and no resources but is investing billions in creating an army that has absolute dominance in the Arab world and in Africa. (Haaretz 12 Apr 06) Why is Egypt doing this? Steinitz doesn’t have a solution, but he makes a proposal: Instead of Israel depending on her Air Force that could be wiped out by an overwhelming surprise attack (just as Israel wiped out Egypt’s Air Force in the Six Day War), Israel should invest in more tactical missiles that are cheap and precise, and Israel should transform herself into a sea power where, at least if tiny Israel were hit with nuclear weapons, her submarines would have the last say. To add to Israel’s apprehensions, the Qatar-based Arab television network, Al Jazeera, has entered the “information war” with a new satellite station which will broadcast 24/7 in English. They have unlimited funds, and Israel knows she is far far behind in the “image” race. Israel’s pitiful response is to be thankful that Israelis like gay icon and recording artist, Ivri Lider, are making appearances on American campuses to prove that Israel is not all war and violence. Israel is truly without hope, were it not for the God of Israel! While watching these events unfold, it has struck me as providential that during this critical period - when Islam is revealing more emphatically her utter obsession to destroy Israel and her desire to create a Muslim world - that there have been three men with moral clarity who have Christian values and beliefs that weighed in to stand with Israel against the vast number of Islamic nations and their sympathizers. The three are Bush, Blair and Howard Brown of Australia. All three have been harmed politically because of the fact that Islamic radicals, helped by Iran and Syria, have proven a formidable and seemingly unconquerable enemy in the political, military and informational arenas. And all three men have suffered because of their positive stand for Israel’s right to exist as a nation. What born-again Christian does not know that the Bible says the whole world will turn against Israel? Whether this means every nation or simply most nations, we do not know. It obviously does not mean every individual, because those who love God’s Word, live by it and understand the times, will continue to stand with Israel. And for us who believe, God is giving us a large time clock that warns us we are coming to the end of the Age. As the shadows deepen and Israel looks around for a friend, any friend, she is finding that there are two sources: the Jewish community around the world (which is diminishing because of low birth rate and intermarriage) and the evangelical Christians. That’s basically it. But unity against Islamic jihadists is not to be. Meanwhile, satanic forces, in the shape of fanatical Islamists, will continue to work towards wiping Israel off the map. Iran’s Ahmadinejad will continue to anticipate the 12th imam’s apocalyptic messianic dawn, when Jews will be killed and the nations will submit to the proud Islamics under Sharia law. But Yeshua’s instructions to us are amazing - against all earthly wisdom. We are not to be despondent. We are not to be paralyzed from fear. We are to lift up our heads because our redemption draws nigh. Why does the Lord tarry? He is waiting for us to finish our life assignments - to bring as many human beings with us to heaven as possible. For that reason, we here in Israel continue to stretch our tent pegs, continue to pray with Israelis to receive salvation, continue to help poor believers get on their feet financially and continue to help other congregations financially - both Jew and Arab. We continue to translate more Gospel books into Hebrew for the maturing of the Body in our land. 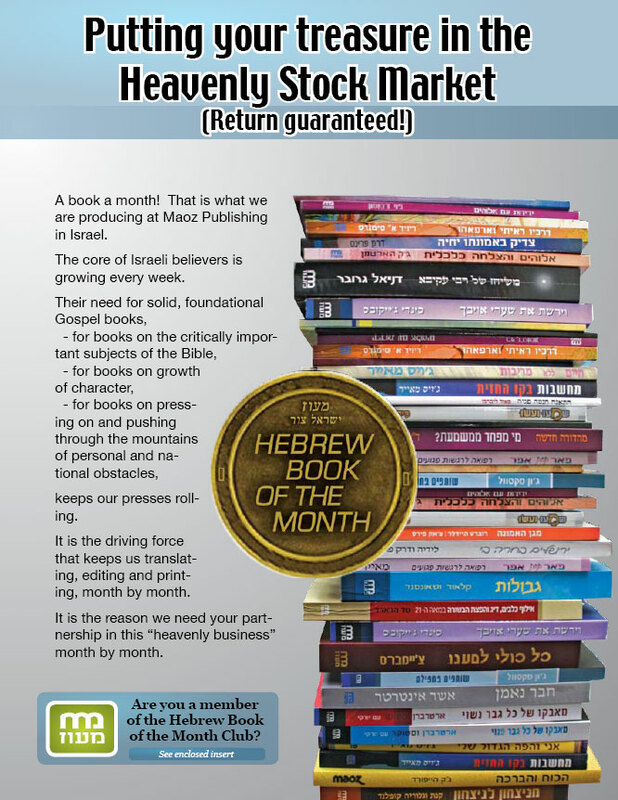 We are urged to publish more books at an even faster rate as we see the need and hunger among Israel’s believers. Our God, the only true God, is waiting for a world harvest of souls. When this Gospel has been preached as a witness to all nations, the end will come, and the True Messiah will reign from Jerusalem! And Israel has been promised an earth-shaking revival in both the Old and New Testaments! All Israel shall be saved! Our job, the job of every believer in Yeshua the Messiah, wherever you are, is to preach the Gospel to every human being and to stand with Israel. We never thought we would be writing you about an agriculture project in a small African country, tucked in just below the Sahara Desert a country that most people have never heard of! But when God speaks, He leads us into the most exciting and significant adventures! We have an opportunity to impact the nation of Burkina Faso with a plan so vast that only God can help bring it into fruition. God has opened huge doors that can change this nation. The standard of living can rise to where the people have enough to eat, and can concentrate on other challenges such as malaria, clean water and education. The Burkinabe Christians will then have opportunities to evangelize their country as never before and also be a strong witness to the other five French-speaking countries bordering Burkina Faso. What a practical, yet eternal opportunity to witness the blessing of Abraham to the Islam-dominated surrounding countries! We believe that the large sums needed for this five-year program will mostly be funded through U.S. and other world aid agencies which are looking for just such projects to invest in. However, NOW is OUR opportunity to give strategic contributions to get this program rolling, so that the miracle of new beginnings in agriculture and economic renewal in this nation will be apparent to all. Very simply, Ram Zango needs a used car for our agriculture expert, Shlomo Sasson. When Shlomo returns in a couple of weeks to Burkina Faso, he will be constantly traveling to different areas bringing basic agriculture technology to the Christian farmers. A good used tax-free pickup will cost approximately $15,000. Any extra funds received will be used to buy basic farming equipment for the agriculture center being established. We invite you to join with us in this opportunity to bless the people who have believed that God would come and help them! It is time for the blessing of Abraham to be manifest in Burkina Faso! The Bible foretold that Israel would be a light to the nations. According to His plan, we believe God has honored us with this unprecedented opportunity to bring expertise that is unique to Israel and to partner with you in order to help this most needy of nations. Help us make this a reality! Happy New Year to you! And may this be the best, most fruitful year of your life! P.S. We thank you for your continuing support for the ministry of Maoz in Tel Aviv and throughout Israel. Your faithfulness keeps us moving forward.